The expertise and experience gained by SKYLOTEC over more than 70 years in the safety at heights industry is already reflected in our sports equipment. SKYLOTEC sets standards in via ferrata like no other manufacturer. 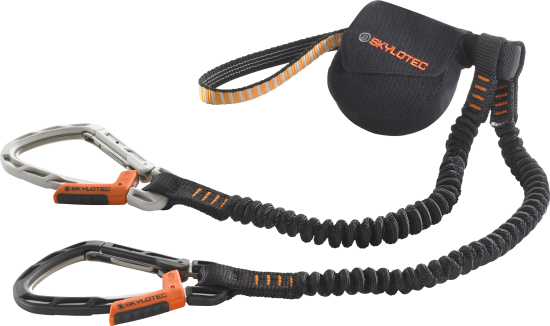 The SKYLOTEC RIDER 3.0 makes climbing on a via ferrata safer than ever before. 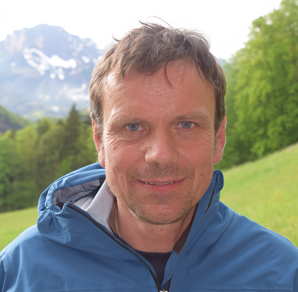 These outstanding product advantages also convinced the expert jury at the OutDoor in Friedrichshafen. 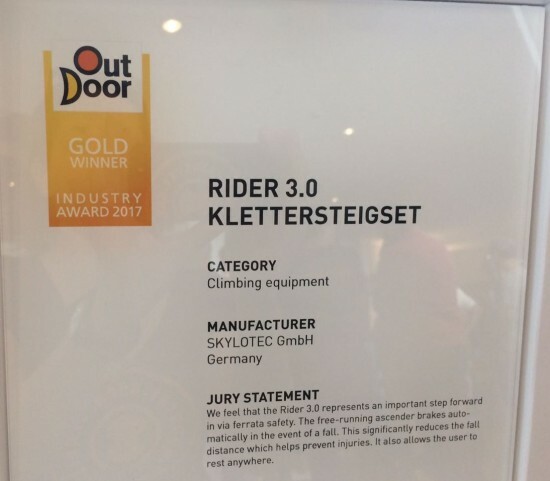 They awarded the SKYLOTEC RIDER 3.0 with the OutDoor INDUSTRY AWARD 2017 in GOLD! A total of 330 products were submitted. 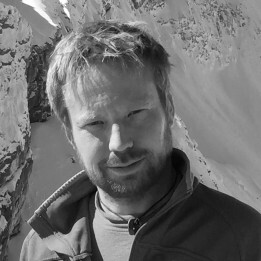 In the category “Climbing equipment” the jury evaluated 20 products. 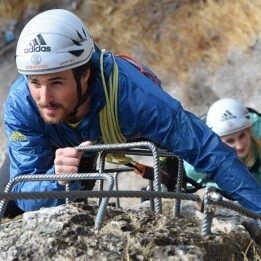 Along with physical fitness, good footwork and self-awareness, the most important things when it comes to staying safe on the via ferrata are a climbing helmet, climbing harness and via ferrata set. A lightweight climbing helmet provides protection against head injury from falling stones or a fall, the climbing harness secures the climber to the via ferrata set and to the steel cable on the via ferrata. All three of these protective measures make up the basic safety equipment on the via ferrata. It gets even more interesting when it comes to the via ferrata set, or rather its central component, the shock absorber: even during short but hard falls, the absorber tears apart, absorbing all the kinetic energy from the fall instead of the person’s body. This reduces the impact of the fall, which would otherwise be considerable. 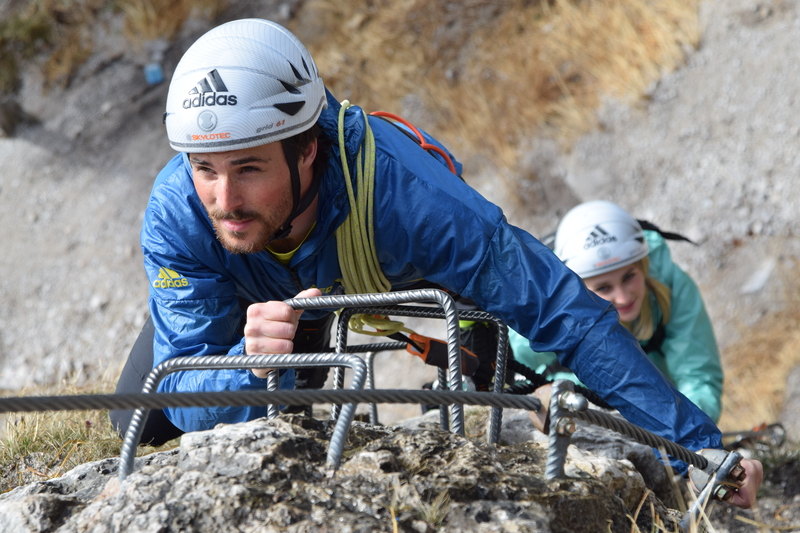 The RIDER 3.0 is a specially designed via ferrata set and its clever technology makes it the safest on the market. The way it works makes it completely different from standard sets. 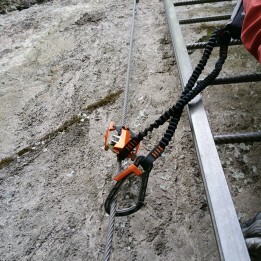 Until now, via ferrata carabiners only ran along the steel cable, which in some circumstances can mean long falls back to the last intermediate anchor point. The RIDER 3.0 can effectively prevent this from happening. Consisting of a shock absorber, two arms with a stainless steel via ferrata carabiner and the free-running ascender with automatic blocking function, when used correctly, the RIDER 3.0 represents the latest and safest generation of via ferrata sets. 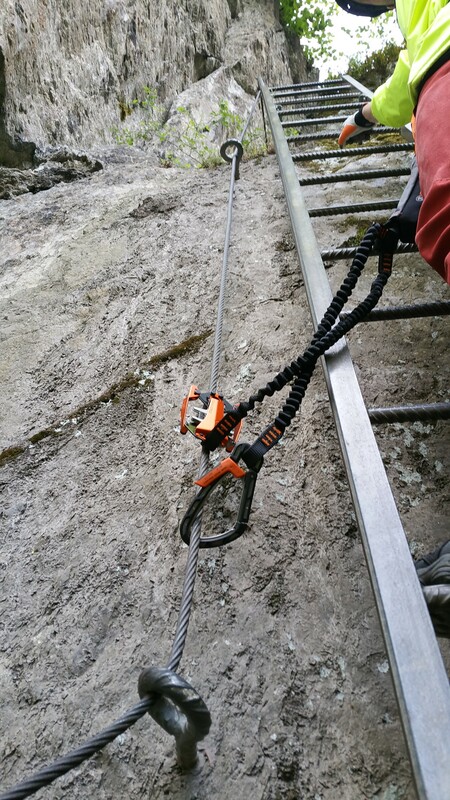 The free-running ascender has been especially designed for use on a steel cable and is suitable for via ferrata routes with a steel cable diameter of 12 to 16 millimetres. The cable guy will help users to determine the required steel cable diameter. It may well be tempting, but the RIDER 3.0 has not been designed to let you have a rest wherever you feel like it on the via ferrata. 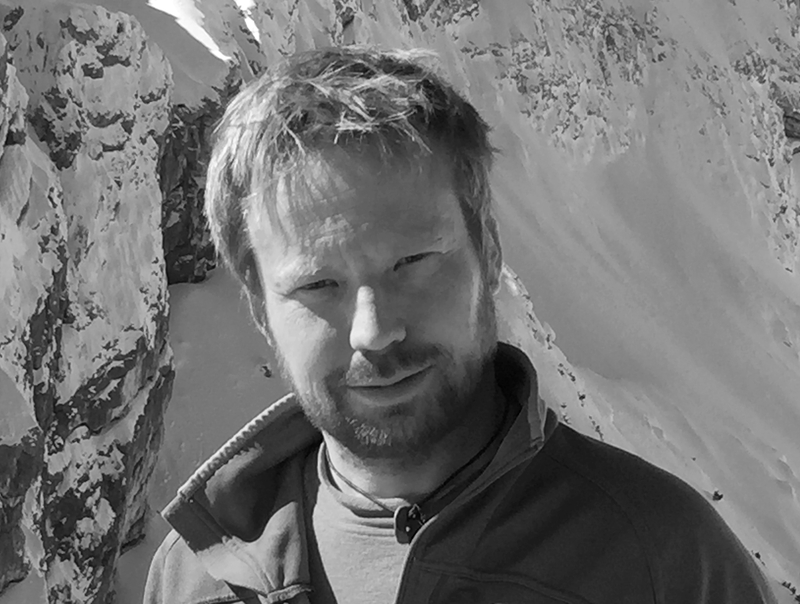 As with standard sets, the rest or belay position should still be attached to a safe intermediate anchor point using webbing slings and HMS carabiners. The shock absorber should only be used in extreme cases! If you fall, the ascender blocks automatically, immediately preventing a fall to the next anchor point. As usual, the system is reattached redundantly to the intermediate anchor point, which means that the climber is always secured to the steel cable. So the RIDER 3.0 prevents climbers from falling long distances at all times. If the cable is too thin or too thick or chains are used, an HMS carabiner can easily be fixed to the loop on the top of the RIDER 3.0 for the normal level of safety. "We feel that the Rider 3.0 represents an important step forward in via ferrata safety. The free-running ascender brakes automatically in the event of a fall. This significantly reduces the fall distance which helps prevent injuries. It also allows the user to rest anywhere." 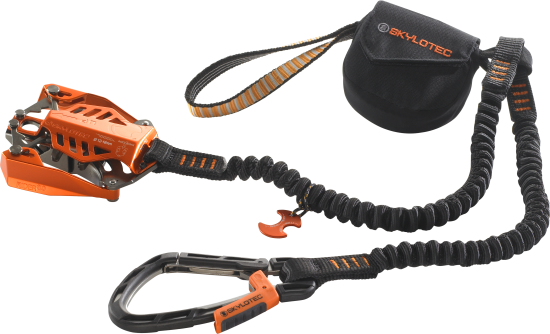 Who likes to take part in courses of the Via Ferrata School Berchtesgaden (www.klettersteigschule.de), can convince him or herself of the SKYLOTEC RIDER 3.0. “The biggest source of danger, aside from the objective risks of climbing on a via ferrata, is falling. This must be avoided at all costs. A long fall, whether through the climber’s own fault or caused by external influences (e.g. rock falls), will lead to serious injury in most cases. 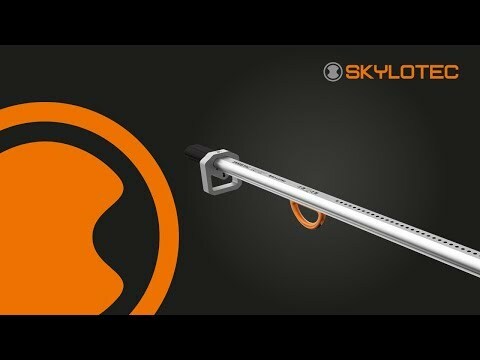 The SKYLOTEC RIDER 3.0 has been especially designed to prevent such a fall on the via ferrata from happening in the first place. The automatic blocking mechanism prevents the worst case scenario – falling back to the last anchor point – from happening, which in most cases will not be without consequences for the falling climber and the person behind. 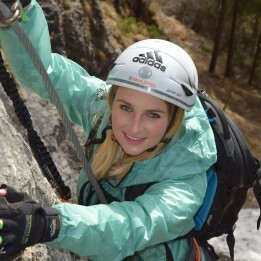 What’s the best via ferrata equipment for me? 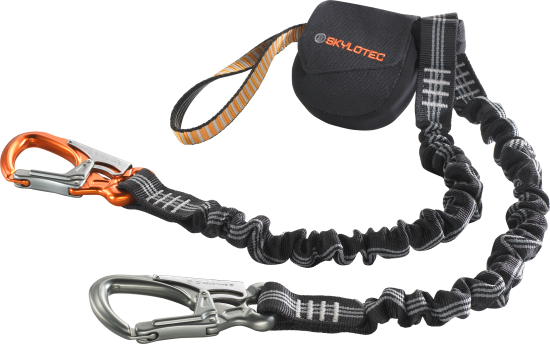 The robust, extremely wear-resistant stainless steel via ferrata carabiners of the SKYLOTEC SKYSAFE III or the SKYLOTEC RIDER 3.0 are recommended both for ambitious via ferrata climbers, as well as for those who have high standards when it comes to selecting their equipment. These sets are the first choice, particularly when it comes to the steepest or even overhanging terrain. 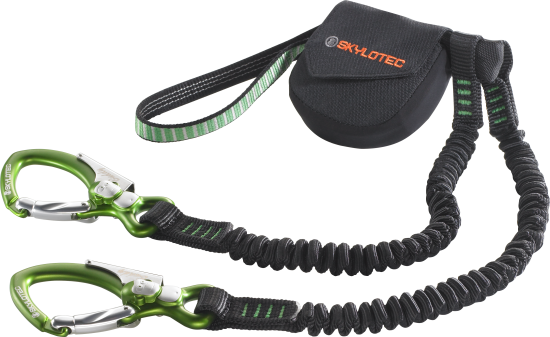 Particularly robust Y-arms and durable, ergonomic aluminium carabiners with palm-squeeze mechanism are the special features of the SKYLOTEC DURO via ferrata set. The design of this set has been heavily based on industrial requirements for safety at heights and even exceeds the strength properties required by via ferrata standards. Robust and offering perfect handling, it is the equipment of choice for mountaineering schools and via ferrata schools, where the sets are able to withstand the toughest conditions due to frequent use. The definitive set for regular and intensive use on moderately challenging via ferratas. Children and young people will need to be belayed from above in particularly exposed or dangerous sections. Webbing slings, HMS carabiners, the semi-automatic SKYLOTEC LORY and a 10m climbing rope makes this easy and safe to achieve from above. Table: Recommended areas of application for via ferrata sets. 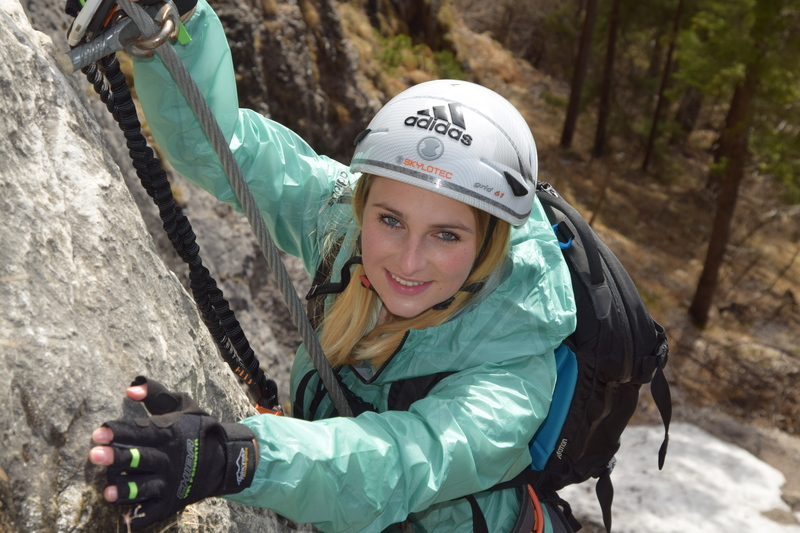 A via ferrata set – including personal protective equipment - can never compensate for physical condition, experience, self-awareness and self-control and is just one component of the many safety requirements on the via ferrata.